A few weeks ago I shared our kitchen's before and after photos. This post (aside from all the clickthroughs I get from posting about the most adorable dog ever months back) has been the most-visited one on this here lil' ol' blog of mine, and it's one I'm very proud of. Shortly after the post went up, Alison commented that perhaps a step-by-step post of the process would be a good idea. Well, slap me sideways, I'd photographed all our steps with the intention of posting the step-by-step, but got so caught up in the "after" I failed to post about how we made the transformation! Thanks, Alison, for the suggestion! Essentially, we just felt that the original cabinets drabbed things down a bit, and were convinced a fresh coat (or three) of bright white paint would spruce everything up quite nicely. The process began at Home Depot (as most of them do) where we hemmed and hawed over the absolute perfect shade of white.... Just kidding. We walked down one aisle, and decided Behr's Ultra Pure White Semigloss Enamel Interior Paint would probably do the trick just fine. I'm always tickled by just how many shades of white there are on the market - Is "Cotton" the right shade for me? Or would "Clean Linen" work better in this space? Dude, it's white. There are more important things to dwell over.... such as the arrangement of little trinkets on the big, red shelf above. So after we brought the paint home, our first step was taking all the hardware off the cabinet doors, then all the doors off the cabinets themselves (including unscrewing the drawer fronts from each pull-out drawer). This is a step that wasn't photographed. But just imagine the doors being taking off of your cabinets, and you'll probably get a good idea of how it looked. The next step was the priming of the cabinets and doors. Before we actually primed, we wiped down each door, front and back, as well as each cabinet with a slightly damp towel; this clears away any dust or weird stickiness that could possibly compromise the outcome of the paint job. Once we were positive everything had dried after being wiped down, it was prime time, baby! If you'll remember, it was a particularly gorgeous weekend while we tackled this project, so we opted to prime the doors outside while listening to summertime music (like The Sugar Stems - a impossibly catchy, happy band local to Milwaukee... check them out before summer's over!). Inside, we taped off the cabinets with Gorilla Tape so we wouldn't get any primer or paint on our cute robin's-egg blue kitchen walls. On each surface, we added just one coat of primer, brushed on thinly (no globs allowed! ), then waited around for that to dry (about 45 minutes). After everything had dried, we brought the cabinet doors down to the basement to paint (I didn't want to risk the chance for any blades of grass or curious bugs to get stuck in the paint!). We painted one thin coat to the fronts of each of the doors, then went upstairs to paint the first coat on the cabinets fixed to the walls. We began the process using a 3" brush and a smaller 1" angled brush to paint between crevices. These methods were perfect for the cabinets themselves, but it wasn't until the second coat to the doors that we realized a roller was a much, much easier way to go. When we brought in the roller, Eric painted the doors in thin layers, and I followed with the small brush making sure to get all the corners and edges the roller had missed. Looking back, I'd recommend using brushes for the actual cabinets, and then the roller-followed-by-brush method for cabinet doors. After the final coat had been painted, we let everything sit..... And sit.... And sit. We let the doors dry for five whole days before attempting to reattach them to the cabinets. This was to ensure everything was perfectly set so no thumbprints, nicks or tears would show up while we handled the doors when reattaching them. Honestly, I think you could get by just fine on waiting three days. Mostly we were being cautious. Partly we were procrastinating. All that was left was matching doors to the appropriate-size cabinet space and drilling everything back into place. We had kept every screw and hinge from the cabinet doors in separate plastic baggies to keep things organized. Each door's hardware was kept in its own baggie, so when it came time to reattach everything, there was no guessing game played with "what hinge piece goes with which door." We popped the hinges into the doors and screwed those on first. Then, we screwed the hinged doors to the cabinets. Eric was in charge of the power drill while my job was holding the doors in place. The whole screwing-the-doors-back-on process went a lot faster than I thought. And once they were all on I wish I could say I was ecstatic about the outcome - I wasn't. It all just seemed so....... so white. I was nervous that we'd spent the last week or so doing this project and ended up ruining everything. I mean, these white, blank-fronted cabinets didnt' look terrible, but they needed pizzazz. They needed a pick-me-up. They needed some modern hardware. After scouring the Internet for the perfect knobs and pulls for our "new" cabinets, I found some that I absolutely loved.They were different, sleek and modern - our kitchen definitely has a little retro vibe, so I thought these would balance that out perfectly. We wanted to put on the hardware before some guests were coming for the weekend, so I had to buy them right away. Before grabbing a 20% off coupon from Lowe's and heading to the store, I made a note of the numbers of both knobs and pulls we'd need for our cabinets. Only, when I got there, I couldn't find them. I scoured every display board of knobs there, and they were nowhere to be found! I had confirmed online that these were in stock at the Lowe's location I was visiting, so I couldn't understand what was up. Until I actually looked up. Apparently, these knobs were special-order only. I pouted for a bit, called Eric in a frenzy, and was reassured that they are just knobs. There's no need to special order knobs, and he trusted me to pick a new set that would look just as great. This was a lot of pressure to be under. If you know me at all, you may be keenly aware that I'm not the best decision-maker when faced with a multitude of options. If you want to see for yourself, join me on a trip to Subway; I get impossibly flustered when trying to tell the sandwich artist exactly want on my 6-inch sub. Faced with the question of "what kind of bread?" I instantly become a bumbling wreck. Moving on, there I was, face-to-face with the five-to-six giant boards filled with knobs and pulls of all sizes, shapes and finishes. I nervously pored over my options, wiping the sweat from my brow so the middle-aged couple beside me couldn't recognize my fear. Finally, I saw a couple options that looked palatable. I looked from one knob to the other, back and forth, and finally just chose one. But then I remembered I also needed to choose a style of pull. If this wasn't a #whitegirlproblem, I don't know what is. However, I will say my decision on the pulls was made a bit easier by the fact that I had to have them narrowed down to only 3-inch options - the existing drill holes in the cabinets were made for 3" pulls, and we weren't going to fill the holes, smooth everything over and then redrill. We would get 3-inch pulls and that would be it. Eventually, I settled on this knob and these pulls. And, gang, they look pretty good. In fact, I really like them. In double fact, once they were all attached to the doors and drawers, I thought they added the perfect, polished touch. I was extremely pleased I made a good decision on both while suffering only a minor meltdown in the middle of aisle 17. Less than $150 for a complete kitchen transformation. With the addition of the $300 VARDE kitchen island and the $20 red LACK shelf (both from IKEA), the overall total of kitchen tweaks was a mere $467, give or take. 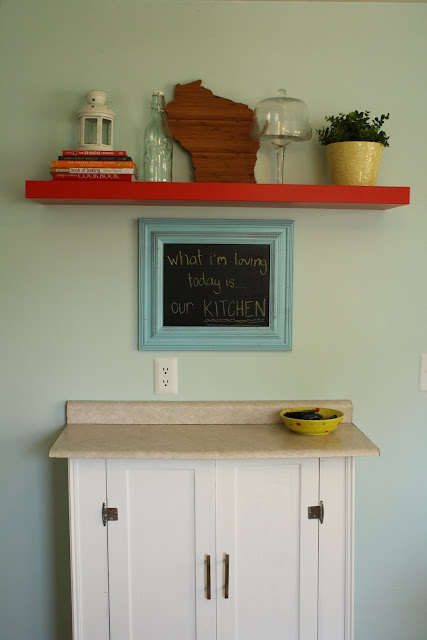 Do you have a more specific question about how we painted our cabinets? Ask in the comments and I'll do my best to explain!